Every American president in the last twenty-five years has appeared on television to announce he was bombing Iraq. It was recently President Obama’s turn. It was immediately clear that he needed foreign flags in the air more than foreign soldiers on the line and Canada obliged. Prime Minister Harper signed on and sent 69 advisors. Two weeks ago in New York, according to Mr. Harper, the United States asked Canada for more help. He should have said no. There are Canadian bones in war cemeteries around the world. Canada also played major roles in creating and sustaining the United Nations and NATO; both designed to prevent the digging of more graves. We should be proud that Canada has done its bit. However, we should be equally proud that Canada has often said yes to its national self-interest by saying no. In 1775, Boston’s rebellion was morphing into a larger revolution. The rebel Continental Congress dispatched Benjamin Franklin to Montreal to woo Quebecers to its cause. Rebels had convinced thirteen British colonies to join and wanted another. They failed. Quebec’s leaders said no. The Québécois had little interest in joining a rag-tag group of rebellious fellow colonies, only two of which allowed the practice of their religion, and whose army mistreated civilians, stole property, and spread a worthless currency. The Canadians – and they were already called that – would not fight. In saying no they stayed Canadians. This year we are commemorating the hundredth anniversary of the First World War. Canadians were changed by the sacrifices of too many young men in Flanders’s mud and on Vimy’s ridge. Before the war we were British. Afterwards we were Canadian. At the conclusion of the peace negotiations, Britain insisted that it would sign the Versailles Treaty on behalf of its dominions. At that point Canada’s economy was dependent on Britain and for all intents and purposes its foreign and defense policies were one. And yet, Canada’s Prime Minister Borden said no. He insisted that Canada sign as an independent country. Shortly afterwards, in 1922, bungled communications led Turkey to threaten war with Britain at Chanak. Britain had committed itself to protecting access to the Black Sea and asked Canada and others to send soldiers to help. Prime Minister Mackenzie King said no. The Chanak crisis, after all, was as removed from Canada as was its outcome from Canada’s interests. As befits a sovereign country, we refused to respond as we had in 1914 – with a hearty, “Ready, Aye, Ready”. In May 1961, President Kennedy met with Prime Minister Diefenbaker in Ottawa. Kennedy said he wanted Canada to join the Organization of American States, stop trading with Cuba and China, become more involved in Vietnam, and to station American nuclear weapons in Canada and with its NATO troops in Europe. Diefenbaker was committed to fighting the Cold War but he was also a nationalist who believed that Canada’s contributions to that struggle had to be consistent with its values and interests. 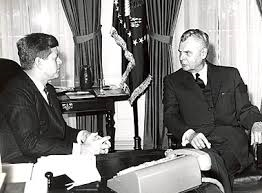 Diefenbaker told Kennedy no, no, no, and no. It was perhaps the first time in Kennedy’s life that anyone had told him no. 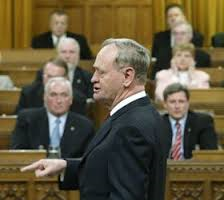 Mr. Harper looks on as PM Chrétien says no to sending troops to Iraq. Now, Prime Minister Harper has stated his belief that young Canadians should offer themselves to slay and be slayed in Iraq because it is in Canada’s best interests to fight one of many terrorist organizations at work in the Middle East. More tellingly, he said in the House on October 3, “If Canada wants to keep its voice in the world, and we should since so many of our challenges are global, being a free rider means one is not taken seriously…When our allies recognize and respond to a threat that would also harm us, we Canadians do not stand on the sidelines. We do our part.” His words did not have the same ring as “Ready, Aye, Ready” – but the point was the same. We owe it to ourselves to participate in our national conversation and to carefully consider the prime minister’s argument. In doing so we should consider Canada’s history of responding to allied invitations to send our young people into harm’s way – to send our children to kill theirs. Perhaps in our contemplation we will recall that the word that, more than any other, that has always indicated Canada’s taking of another step toward sovereignty has been no. An edited version of this column appeared last week in the Ottawa Citizen. If you like this column, please consider sharing it with others using the buttons below and following this blog where I post new thoughts every Monday morning. I enjoy comments too, even from those who disagree – respectful debate is good.